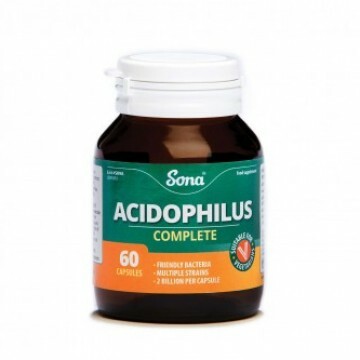 Sona Acidophilus Complete capsules consist of 'friendly' bacteria that help to re-establish and maintain a favorable intestinal flora, especially during and after a course of antibiotics. Sona Acidophilus Complete capsules are made of the highest quality and provide 2 billion viable organisms per capsule, including 3 strains. These friendly bacteria colonise the gut and help re-establish and maintain a favourable intestinal flora, especially during and after a course of antibiotics. Suitable for coeliacs and vegetarians, acidophilus complete is free from any artificial colours, flavourings and GMOs.